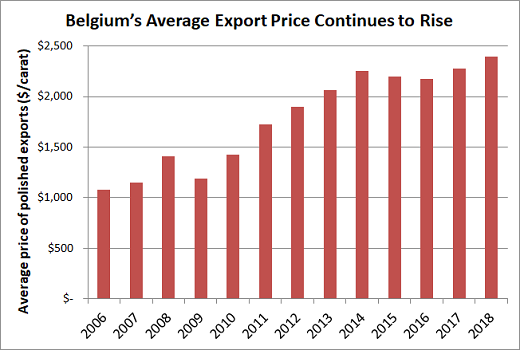 RAPAPORT... Belgium’s polished exports were flat in 2018 as a higher average price offset a drop in volume, according to data the Antwerp World Diamond Centre (AWDC) released recently. Weakness in the market for smaller stones prompted an increase in trading in larger diamonds, leading to the highest annual average price on record, Rapaport archives show. Strong polished demand in the US and Hong Kong also drove the rise in value, mitigated by tariff disputes in the second half, the AWDC added. Trading slowed in December. About the data: Belgium is usually a net exporter of polished diamonds. As such, net polished exports — representing polished exports minus polished imports — will normally be a positive number. The nation is also a net exporter of rough. 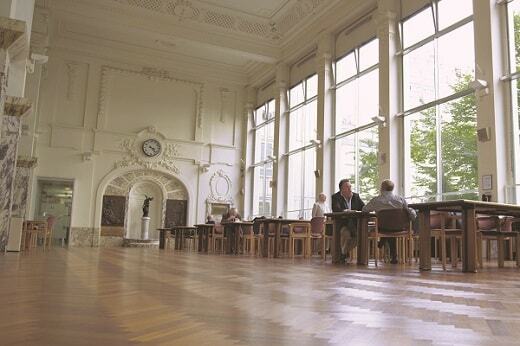 While Antwerp is home to some high-value manufacturing, its main role in the market is as a facilitator of rough-diamond trading, with companies from around the world coming to the city to buy rough. The net diamond account is total rough and polished exports minus total imports. It is Belgium’s diamond trade balance, and shows the added value the nation creates by exporting rough or manufacturing it into polished.